The ibis budget Luxembourg Aéroport hotel is located next to Luxembourg Airport, making it the ideal place to begin your journey. Stay for a night before your flight and make sure you visit Luxembourg City if you have time! The ibis budget Luxembourg Aéroport is very close to the Findel airport (served by LuxAir) and is ideal for both tourists and business travellers. Discover Luxexpo and Kirchberg, the European District, the museum quarter in Luxembourg and the world famous Opera House. This low budget hotel combines comfort with the best services: air-conditioning, free WiFi internet and a breakfast buffet. Free airport shuttle service and free parking are provided! We are currently in the process of renovating our rooms to enhance your comfort. The work will take place floor by floor, on weekdays. We will do everything we can to minimize any noise or inconvenience that this may cause. 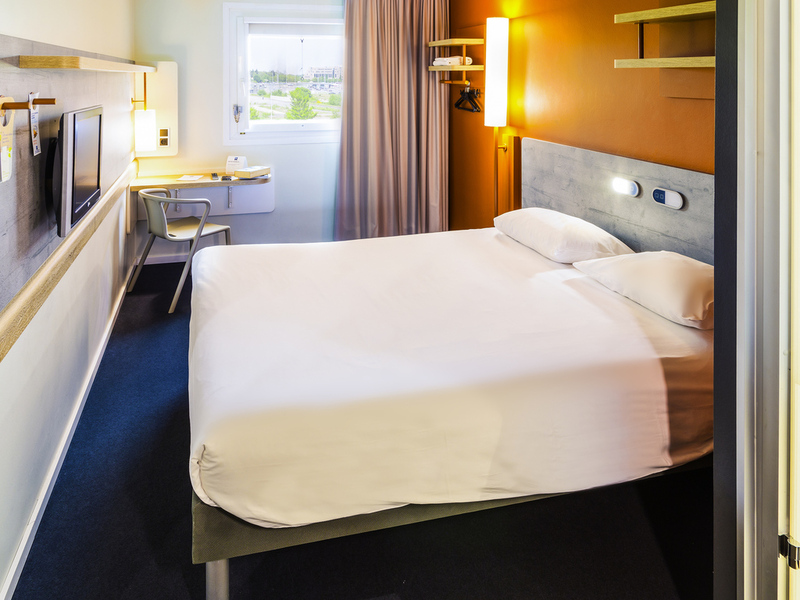 The modern and practical rooms of Ibis Budget Luxembourg Airport have a comfortable bed, shower, toilet, desk and TV. Do you travel with your family? Our family room can accommodate up to 4 people.